Excessively dry air in your home can lead to a variety of issues. If you’re suffering from dry skin, sinus congestion, cracked lips or nosebleeds it’s more than likely that the humidity inside your home is too low and you need a humidifier. A humidifier can increase the moisture in the air and protect you and your family against these common problems. They're particularly useful during the winter months when the humidity naturally drops, and we start cranking up our heating systems which dry out the air even more. You may know someone that has tried using a humidifier and has been left feeling disappointed or ripped off. Usually, this is because they have opted for a small portable model that does not have enough power to humidify a sizeable room. You do not want to waste your money on one of these smaller ineffective units! If you want to make a meaningful impact on the humidity levels in your home, you need a large capacity humidifier designed for large rooms. With a powerful large capacity humidifier, it’s easy to increase the humidity level at home! We’ve reviewed and rated the best large room humidifiers that can rapidly increase the moisture in the air and automatically maintain the appropriate humidity level to make your home more comfortable this winter. What Is the Recommended Level of Humidity Inside Your Home? 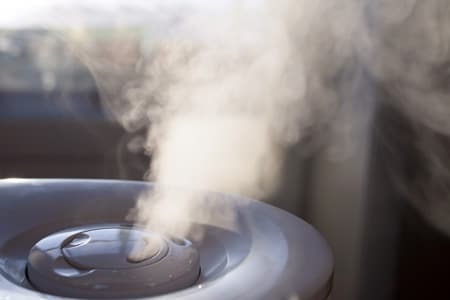 Why Is Cleaning and Maintaining Your Humidifier so Important? Which Large Capacity Humidifier Is the Best Choice for Your Home? There are a lot of different humidifiers to choose from and knowing which one is best for you can be confusing and overwhelming. Based on research and testing as well as a careful assessment of user reviews, we have put together this comprehensive list of the best humidifiers for large rooms. The Levoit LV600HH Hybrid Ultrasonic Humidifier is the best choice if you need to increase the humidity in a medium to a large sized bedroom. Stylishly designed so that it fits into modern home decors, this humidifier sports a sizeable 1.5-gallon tank. In practical terms, this means that you can leave the unit running overnight without any need to worry about the water supply running out. There's also no need to worry about the noise of this unit if you choose to run it while you sleep. It’s a large ultrasonic humidifier that has been engineered for quiet operation. Even when operating at full capacity, the machine emits only 36dB of noise. There is also an option to turn the display off if you have a problem with the brightness of the screen at night. If there’s such a thing as a luxury humidifier, the Levoit LV600HH would fit the bill. Not only is it reliable, quiet, and well-built, but it also has some extra features to make your life just a little more comfortable. One of the more useful features on the Levoit LV600HH is the humidistat. It allows you to to set a target humidity level that will be maintained automatically. You can even operate this unit with the included remote control, so you don't need to get out of bed to adjust the humidity levels in the middle of the night! The built-in timer and waterless shut-off features also make it easy to ‘set it and forget’ so you can focus on what’s important in life and put daily air care out of your mind. The unit also comes with an aroma box so you can enjoy the relaxing and healthy benefits of essential oils and therapeutic scents. It’s almost like turning your home into your own personal spa! Depending on your preference, you can choose between cool mist or warm mist to disperse from the two 360 degree rotating nozzles which can cover an area as large as 280 square feet. This humidifier is not only easy to use, but it’s also straightforward to clean and refill. The large opening at the bottom of the tank gives you easy access to fill the reservoir and to clean it to prevent any mold. This is a premium unit that works perfectly in large sized rooms. It’s quiet, reliable, full of great features, and the mist output level can be adjusted with ease. If you want the best humidifier for a large room, we highly recommend the Levoit LV600HH. The AIRCARE MA1201 is a heavy duty multi-room humidifier that can cover a whopping 3600 square feet. If you need a device that can maintain the optimal level of humidity throughout a large living area or the whole house, this is the ideal choice. This humidifier features a massive 3.6-gallon tank, which will last for 36 hours of operation. Although this makes the unit quite hefty when full, the wheels on the base of the AIRCARE MA1201 ensure that it is still easy to move around. With this unit, you have the option of four different fan speeds, with an easy to read digital display that tells you which mode is currently in operation. You can also use this interface to set a target humidity level which the unit will work to maintain. During the evaporative process, a built-in wick filter adds invisible moisture to your environment as the humidifier moves dry air through the wet filter. The wick filter also traps mineral deposits, so it outputs only fresh air. While the AIRCARE MA1201 is a very capable humidifier, it is quite large, and it will stand out in your room. You will want to consider ways of hiding it behind other furniture. Not everyone has loads of cash to spend on a brand new humidifier. That does not mean you have to go without though! This high-quality unit by Everlasting Comfort is a great budget-friendly option. With a 1.6-gallon tank and a high mist output of up to 270ml/hour, this unit is perfect for use throughout the day and night with minimal need for refilling. The Everlasting Comfort ultrasonic humidifier can run for up to 50 hours before it needs to be refilled, which is outstanding. The 360-degree rotating nozzle disperses water vapor throughout the room quietly and efficiently. In fact, the humidifier is quiet enough to leave on at night without disturbing your sleep. The Everlasting Comfort humidifier does not require any filters. For the budget conscious user, this is perfect as it reduces the ongoing costs of running the unit. The automatic shut-off feature also helps to ensure the humidifier is not running without water to prevent any damage to the unit. One particularly interesting feature is the essential oil tray. Using this, you can add a scented oil of your choice which will then be dispersed around the room along with the water vapor. At the end of the day, this is a reliable budget humidifier for big rooms, but it does lack some of the more advanced controls and features of more expensive units. The Vornado Evap40 evaporative humidifier is an effective way to add extra moisture into the air in your home. It utilizes a unique vortex system of air circulation to boost humidity rapidly and evenly throughout the room. Rather than the typical circulation used by evaporative coolers, this vortex system speeds up the circulation of the air to all corners of the space. 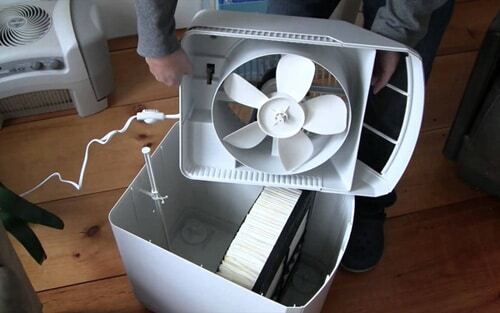 With this method, the Evap40 can humidify an impressive 1,000 square feet. At the highest speed, the 4-gallon tank will run out in 24 hours, but if a lower setting is used the humidifer can last much longer. 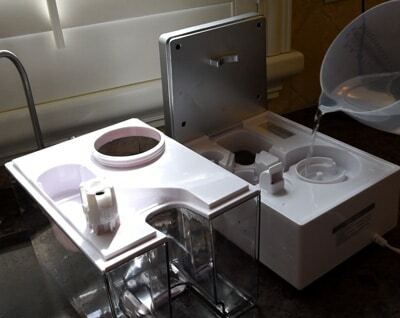 With such efficiency, it reduces the number of refills required making your life a little easier. Although there is no digital display, the dials for setting the humidity level and fan speeds are easy to use and very intuitive. You can set the level of humidity you desire, and the unit will shut off once that level is reached. The humidifier itself is well built and has an eye-catching and unique design. You can immediately tell that this model will stand up to a lot of use and the manufacturer backs their product with a 5-year warranty. While this is not the most functional unit on the market, for the price and size of the humidifier, the area it can humidify is quite impressive. The AIRCARE EP9 800 is a whole home humidification solution. Weighing in at a hefty 27 pounds, it can humidify an impressive 2,400 square feet. Despite the large size and weight, the unit is easy to move due to the inclusion of wheels on the base. The design is stylish, allowing this pedestal humidifier to fit in with your home decor. With a capacity of 3.5 gallons, the AIRCARE EP9 800 can run for up to 60 hours between tank refills. When you do need to refill the unit, there is an easy to use spout. You can control this unit with the simple digital display on the front of the humidifier. There is a total of nine fan speeds you can choose from, depending on how large an area you need to cover and how fast you need the air humidified. On the display panel, you can also specify your desired humidity level. Once this is reached, the unit will shut itself off, conserving energy and water in the storage tank. Made in the USA this high-quality large capacity humidifier is the perfect choice for increasing the moisture throughout your whole house or large living areas. If you only need to humidify a small space such as a bedroom, then this large unit is probably overkill. The Vornado EVDC500 is a very ergonomic and stylishly designed humidifier that can cover an impressive 1000 square feet, despite its small size. Like other Vornado humidifiers, this model utilizes their proprietary ‘vortex’ fan system to humidify all the air in the room quickly. Where the EVDC500 differs from other models is its focus on energy efficiency thanks to the energy smart DC motor and smart energy saving mode. The manufacturer claims that this model uses 90% less energy compared to a Vornado AC motor-driven humidifier. With the smart energy saving mode, which is activated by the push of a button, the unit can stay operational but draw as little as 1 watt to keep you comfortable. 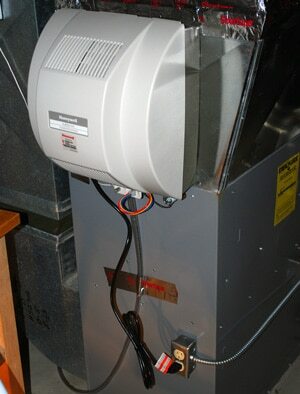 The humidifier will also shut off when the target humidity is reached and when the water tanks are empty. The next best feature on this unit is the easy to fill water tanks. While other humidifiers make the refilling process a real chore, the EVDC500 makes this process seamless. Two separate 1-gallon tanks are on each side of the humidifier and can be taken off for refilling. The large openings on these tanks make refilling and cleaning a breeze. With a 5-year overall warranty and a 10-year warranty on the electric motor, you can rest assured that this humidifier will last the distance. The Vornado EV200 evaporative humidifier is one of the smaller units in the Vornado lineup. It has many of the positive features of the larger models, but only sports a 1.5-gallon tank capacity and is only suitable for spaces up to 700 square feet. This model also utilizes the unique vortex action to circulate the humidified air through the room. The fan has two speeds that you can alternate between as needed along with auto-humidity control to achieve and maintain your ideal humidity level. On the highest setting, the EV200 will consume approximately 2.6 gallons per 24 hours. However, on lower settings, this consumption can be reduced. When it is time to refill, the designers have tried to make the process as painless as possible. This unit uses the same two tank design as other more expensive units in the range. These tanks can be removed and refilled using the large openings. Many users also appreciate the access these large openings give for cleaning the interior of the reservoirs. Like other humidifiers in this range, the company offers a lengthy 5-year warranty. This highlights the company's commitment to quality and their unwavering faith in the sturdiness of their products. The AIRCARE 831000 evaporative humidifier is a heavy-duty unit designed to humidify large spaces up to 2,700 square feet. If you have large rooms, especially in an open plan living layout, this humidifier is an excellent choice. With the 6-gallon tank, the unit can run for as long as 70 hours when using the most economical setting. This allows you to set it and forget, without the constant worry of having to refill the tank. The reservoir itself has a wide opening that makes refilling with a jug easy and straightforward. Should you need to move the unit around, it has been made easy due to the caster wheels fitted on the bottom. You can cycle through the humidity settings and different fan speeds using the control panel on the front of the humidifier. With the adjustable humidistat, you can set your desired humidity level, and the unit will automatically maintain it and shut itself off once the set humidity level is met. Regarding build quality, this is a sturdy unit. It is built in the USA using quality parts and materials, so you can trust it to keep on working for years to come. While this may be a great unit if you are looking to humidify your whole home, it may be a bit too heavy duty if you only want to use it in a single room. The Environmental Protection Agency (EPA) has done comprehensive research on the topic and concluded that indoor humidity levels should be kept below 60% and ideally between 30-50% at home. Humidity levels over 60% encourage the growth of mold, bacteria and dust mites, while levels below 30%﻿ can cause other concerns like dry, itchy skin, nosebleeds and sinus irritation. The more advanced humidifiers have a built-in humidistat which you can use to set your preferred humidity level in your room. 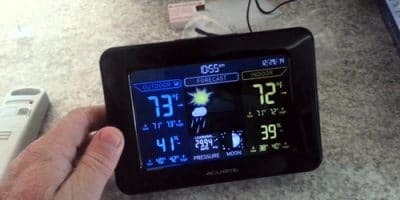 It is also a good idea to have a hygrometer as a backup to give you accurate readings of the relative humidity. Click here to see our guide on the best hygrometers to use with your humidifier. There are many different types of humidifiers, and they all have unique pros and cons, which can make choosing the right model for a large room difficult. Every manufacturer also makes big promises, but it can be hard to figure out whether the humidifier will suit your specific needs. To help you make the right choice, we are going to look at the different types of humidifiers that are available. The following information will help you to understand how they work and which one is best for you. Ultrasonic humidifiers are the latest in humidifier technology and can be an excellent choice if you want a model with minimal noise. They work in a way that sounds complicated but is actually quite simple. Ultrasonic humidifiers create a visible mist by using a high frequency to send vibrations through the water. As the water vibrates, water droplets form, which are then distributed through the room, increasing the moisture in the air. The main benefit of these units is that they do not need noisy fans to operate. Not only does this save electricity, but it also makes them super quiet which is perfect for use in bedrooms at night. Some users experience problems with ‘white dust’ when using ultrasonic humidifiers. This residue is a result of the minerals in tap water that are left behind after the mist lands on furniture or others surfaces and dries up. While the residue is not harmful to most people, it could potentially be problematic for people with asthma or other lung/sinus health conditions. The only real solution to prevent white dust is to use distilled water instead of hard water. Large ultrasonic humidifiers are a good option, especially when noise needs to be kept to a minimum. However, they are more suited to medium to large-sized bedrooms rather than large living areas or the whole house. Evaporative humidifiers are by far the most common type of humidifier amongst the large-sized models. This type of humidifier has been around for a long time and can be particularly useful for larger rooms. Evaporative humidifiers rely on both a fan, a wick filter and a water reservoir to operate. The wicks, which are made of a permeable material, pull water up from the storage reservoir. The fan blows dry air into the moist wick, causing the water to evaporate. The purified mist is then circulated around the room, increasing the humidity level. With this effective and simple system, you can get guaranteed results very quickly, but there are some disadvantages as well. First of all, the fan can be quite loud on some units, mainly when the highest setting is used. This can disturb your sleep if you wish to keep the humidifier running overnight. 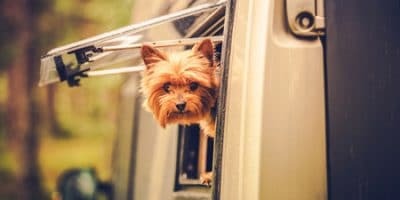 In addition to this, the wick filter needs to be replaced approximately every 4-8 weeks which incurs an extra cost and can prove to be an annoying chore. Despite these negatives, the vast majority of big humidifiers are evaporative as the powerful fan makes them very efficient at humidifying spacious areas. If you are looking to humidify a large living area or even your whole house at a fast pace, then an evaporative humidifier is the best option for you. Many people, especially those building new homes or doing extensive renovations are having whole house humidifiers fitted. These humidifiers are installed as a part of the heating/HVAC system and deliver moist air alongside the home's heating or cooling. These systems can be quite effective and have the benefit of being unobtrusive. However, there are some key reasons why we do not recommend going down this path. The most significant disadvantages to these systems is that they are expensive and limited by the existing ducting in your home. While the air near the ducts will be humidified, other areas of the room can miss out. At least with portable ultrasonic or evaporative humidifiers, you can move the unit to where it is needed the most. You will also need to consider the cost of having a furnace humidifier installed by a professional. It is definitely not a cheap option, and the ongoing maintenance can hurt your back pocket. Warm mist humidifiers work by heating water into steam. The entire process is not only very inefficient, but it can also be unsafe for children. With hot steam and heating coils, it is possible for children or even adults to be burnt. In fact, the American Academy of Pediatrics (AAP) recommends against the use of warm mist humidifiers in homes with children. Despite this, some people do like the warmth that the steam gives. 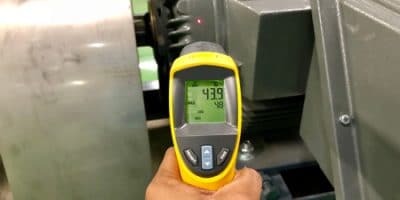 At the end of the day though, the risks and extra costs aren’t worth this small difference as they are no better or worse than humidifying a room compared to an evaporative or cool mist ultrasonic model. Our top product recommendation, the Levoit LV600HH is a hybrid model that can produce warm and cool mist at levels that can be easily adjusted, giving you the best of both worlds if you desire a warm mist model. Now that you have an idea of the best large humidifiers on the market, you face the challenge of selecting the correct one for the size of your house or a particular room. Unless you get a unit suitable for the size of the area you want to humidify, you may be disappointed with the results. Before even looking at a humidifier, get an approximate measurement of how many square feet your room is. Then when choosing a model, you can compare your measurements to the capacity of the unit. As you will have seen in the reviews above, we have listed the coverage area for each recommended unit. These are the guidelines given by the manufacturer. They’ll give you a good indication of what size room the humidifier is best for. Once you have chosen a suitable humidifier, you need to then look at things such as efficiency, noise level, and portability. There is almost always some kind of trade-off when making this choice. For example, the most powerful console units are noisy and heavy due to their evaporative cooling process and large water reservoirs, but portable devices can lack the power for large spaces. At the end of the day, only you can decide which humidifier will suit your needs. The frequency of refilling is also something to consider. The more portable the unit is, the more often you usually need to refill it which can be a bit of a chore. If you plan to run the humidifier for long extended periods, then you may want to look at a larger model that is less portable but has a big water reservoir. If you need a humidifier for a smaller area, particularly bedrooms, then you should get an ultrasonic humidifier. While they're not as powerful as an evaporative humidifier—the advantage is that they make very little noise which allows you to have an undisturbed sleep through the whole night. In addition to the considerations outlined above, we have put together a brief list of other important features to look for. As long as you do your research now before you make a purchase, you are guaranteed to be happy with the humidifier you end up choosing. First of all, you want a humidifier that is easy to operate. This includes being easy to change settings, move around, clean and refill. The controls should be user-friendly—look for a model with a digital display and remote control for the best experience, such as our top pick the Levoit LV600HH. If you want an evaporative humidifier, then ensure that the wick filter is straightforward and inexpensive to replace. One of the biggest complaints people have about evaporative humidifiers, in particular, is the noise they generate. To help you control this, you should look for humidifiers where you can adjust the intensity of the fans and subsequently the noise level. A humidifier with multiple fan speeds will also help you to increase the humidity across a larger area rapidly when required. Another useful feature that you should look for is a timer. A lot of people like to set a timer overnight so that the humidifier runs for a fixed period as they’re sleeping and then shuts itself off automatically. Humidistats are pretty much a necessity in a modern humidifier. They allow you to set a target humidity level and then the humidifier will automatically shut down or activate as needed to maintain that level. Choosing a model with waterless automatic shut-off is a great way to ensure maximum efficiency. This function detects when the tank is empty and shuts the unit off, saving electricity and preventing unnecessary wear and tear on the humidifier. We rated the Levoit LV600HH the best large area humidifier on the market because it has all of these important features and many more. Before you rush out and buy a humidifier, it's important to understand that you will need to regularly clean it to see the full benefits and to prevent any health hazards. If it is not frequently cleaned, a humidifier can become a breeding ground for mold and bacteria. The EPA ﻿recommends cleaning humidifiers every third day. Although evaporative models can be very effective, they also require a bit of extra maintenance. The wick filters in the evaporative models need to be replaced approximately every 4-8 weeks to keep the humidifier working efficiently. Many factors affect the life of the wick, including the amount of use and water hardness. You’ll know when it needs to be replaced when the filter becomes hard and is no longer absorbing water properly. We also recommend using a Bacteriostatic Water Treatment which is specifically designed for evaporative models to prevent the growth of bacteria and algae in the filtration system. This treatment will eliminate any unpleasant odors and maximize your humidifiers effectiveness. If you choose an ultrasonic model, it is recommended to use distilled water in the tank. Tap water can have a higher mineral content (hard water) and can leave a white residue (white dust) around the area where your humidifier is being used. Below, we will outline how you should clean a humidifier. Firstly, make sure to turn your humidifier off and unplug it from the wall outlet before starting any cleaning maintenance. Draining, rinsing and changing the water in the tank before each use is ideal to help eliminate any bacteria that may have started to grow inside the container. Periodically, the tank will need to be wiped down and cleaned with mild detergent and water to remove any buildup of impurities. Preferably twice a week you should do a deep clean of the base. For this, you can use a diluted vinegar solution to clean the unit and remove any mineral deposits. Then use a diluted chlorine bleach solution to disinfect the humidifier which will prevent any bacteria and mold growth that may occur. Ultimately, you should follow the manufacturer’s instructions for the humidifier you have purchased. Overly dry air inside your home can impact your family’s quality of life. Especially when using heating systems in the winter, the air inside your home can be rapidly stripped of moisture causing several annoying problems—ranging from irritated sinuses to nosebleeds to itchy eyes and long sleepless nights. Fortunately, a humidifier is a simple solution that accurately increases the moisture in the air to combat this age-old problem. If you have large rooms or a large home with open plan living, you may think it is impossible to humidify the air effectively, but you would be wrong. As you will have seen in the above reviews, there are many models on the market suitable for use in large homes. It is true that some units are substandard and are hard to keep clean, but if you choose the right product by following our recommendations, you will be amazed at how quickly and easily a humidifier can work. If you’re looking for a full suite of luxury features or a unit for large bedrooms, in particular, we recommend the Levoit LV600HH Hybrid Ultrasonic Humidifier. Its efficiency, user-friendly controls, and quiet operation make it the perfect choice if you want to leave a humidifier running overnight in your bedroom while you sleep. If you need a humidifier for large living areas or even a solution for the whole home, then the powerful Essick Air AIRCARE MA1201 Evaporative Humidifier is your best option. With its impressive ability to humidify large spaces for extended periods, thanks to its big tank capacity and evaporative humidifying process, this heavy duty unit will not disappoint. After reviewing the best large capacity humidifiers on the market, two options stood out above the rest. We found that the Levoit LV600HH ultrasonic humidifier is the best option for a bedroom thanks to its low noise levels, remote control, and digital humidistat. For humidifying large living areas and the whole house, our top recommendation is the powerful Essick Air AIRCARE MA1201 evaporative humidifier which can cover up to 3,600 square feet. I have had a Crane Drop ultrasonic humidifier for about 2 years, no problems. Before I put it away for the summer, I cleaned and dried it out completely. My neighbor just borrowed it for her kids with colds and promptly gave it back to me, saying it didn’t work. I followed the directions in the manual for “red light indicator comes on” and it hasn’t helped. So now I’m in the market for a new, hopefully more durable ultrasonic humidifier for the bedroom. I like ultrasonic ones because they are quiet and I feel they are more hygienic than cool mist evaporative types. I find the reviews on the Levoit LV600HH confusing; is it an ultrasonic humidifier or what? Is it worth the money if you want to use it as an ultrasonic humidifier and not a cool mist one? With proper maintenance, would it last longer than ones like the Crane Drop model? Sorry to hear about your crane humidifier. Unfortunately, humidifiers won’t last forever and will need to be replaced eventually. Great decision to go with an ultrasonic again, they’re perfect for bedrooms! The Levoit LV600HH is in fact, an ultrasonic humidifier, it will function in the same way as your previous Crane model. 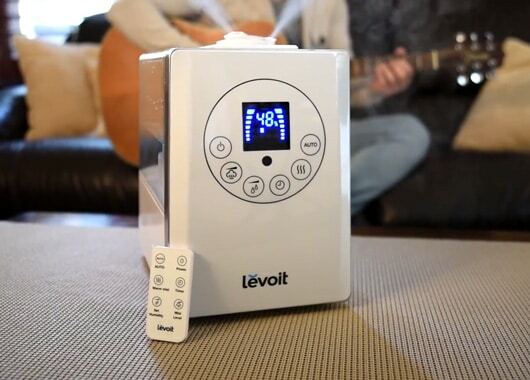 The Levoit is also a hybrid model that produces both cool mist and warm mist, so you get the best of both worlds, but it still uses ultrasonic humidification to create both mists. I can’t guarantee that it will last longer than the Crane Drop model but it does come with a 2-year warranty, and regular maintenance will certainly prolong its lifespan.